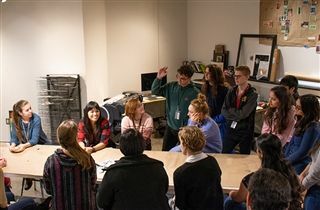 On November 15, KCD grad Risa Puno ’99, an interactive sculptor and installation artist based in New York City, visited KCD to share her experiences and recent work with students and faculty. Ms. Puno spoke to upper school students during X-period as well as during visual arts classes, discussing her current work as a sculptor/installation artist and the career trajectory that took her from pre-med student to studio artist. Ms. Puno’s pieces often require significant engineering, so her discussion of her work was especially valuable to KCD’s fine arts community as they partner with teachers in all STEAM disciplines. Ms. Puno has exhibited at national and international venues and has been interviewed for NPR and Forbes. She was also featured on the cover of American Craft Magazine and has been written about in several other magazines. You can see examples of her work on her website. Thanks to the visual arts program and the KCD Fine Arts Guild for making Ms. Puno’s visit possible.